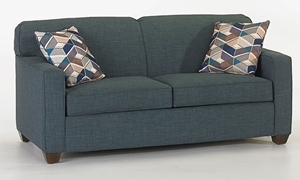 Classic Lawson style sofa with welted sock arms upholstered in muted blue fabric features a pull-out queen innerspring mattress. 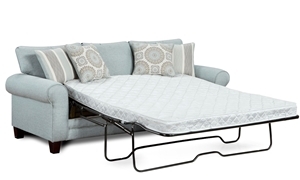 85-inch classic roll arm sofa in cleanable slipcover features 8-way hand-tied coils and transforms into a queen size sleeper. 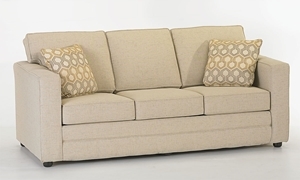 Make the most important room in the house the most functional one as well with a sleeper sofa from Haynes. The living room is already the heart of your home, providing a comfortable place to gather and relax with friends and family. 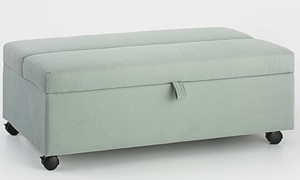 So why not have a stylish sofa with a space-saving secret? 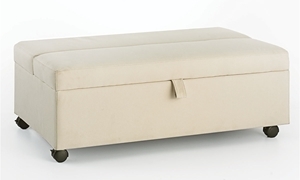 Haynes has pull-out sofa beds, chairs and sectionals from quality brands like Klaussner, Natuzzi and more in a variety of designs to complement your décor. 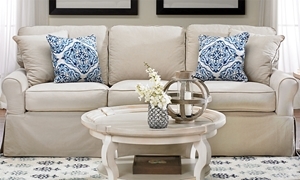 (Many can also be special ordered in dozens of custom upholstery options!) 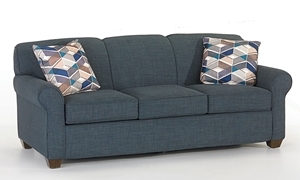 With innerspring and memory foam mattress choices available in twin, full or queen size, your guests will surely appreciate the sleeper sofas Haynes has to offer.